I'm on my way out the door and heading to MAC. I got invited to the Spring Colours Collection party for tonight. The collection is supposed to hit the online stores in Canada and the US today. It's a four part collection basically separated into four color spectrums (what they are calling forecasts). That's the best way I can think to explain it. 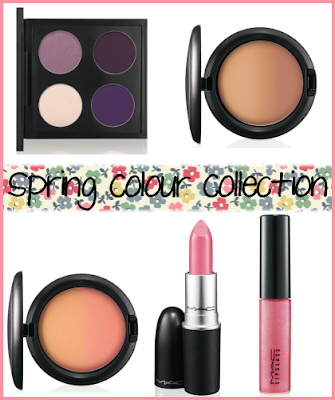 This is also the first collection that MAC is using their updated compacts. I've made up a bit of a wishlist, but obviously what I actually buy could change upon seeing the items in person. So tomorrow, I'll provide pictures and swatches of what I purchased. I cannot say it will be a lot since I just had a huge haul from MAC already. I do want to take advantage of the preview party, though! I'll be sure to share the details tomorrow. 1. Eyeshadow Quad 3- I don't recall MAC ever doing a purple quad, but with not being a MAC addict for a long time...it's very possible that I'm wrong. The colors are all LE with one being a repromote. The colors are Mink Pink, Jungle Moon, Bruised Plum, and Black Tulip. Retail will be US$36 and C$43. 2-3. Blush Ombres- These have me intrigued. These are definitely what I want to see in person before I buy them. The two I really like are Springshine and Ripe Peach. The other two blushes offered seem too dark for myself. Retail will be US$25 and C$30. 4. Phlox Lipstick- Phlox is in the pink spectrum. It's a glaze finish and LE. My mind could completely change on this, because there are two or three others that interest me. I suppose I should stop having such a weakness for pink lips every now and then. ;) Retail will be US$14 and C$16.50. 5. Cultureclash Lipglass- I love a lot of the lipglasses this go-around, but my attention went straight to Cultureclash! If I do end up getting Phlox, I think this will be a perfect companion for it. Retail will be US$14 and C$16.50.